BBM users have started to receive an update to the messaging app that reverses a change that did not go over too well. A previous update made BBM default to using stickers before emoticons. Since BBM users have to buy stickers from the BBM Store, it would make sense for BlackBerry to promote the use of stickers before the free emoticons. BlackBerry has had its ear to the ground lately, listening to its customers. While it didn't completely reverse the changes made with the previous update, it did compromise by pushing out a new dynamic emoticon/sticker picker (got to love that name). If you type something in the text field and hit the emotion picker, it will show an emoticon like in previous versions of BBM. But if you don't write any text and click the button, it will give you the option to send a huge sticker. This change is being made available to Android and BlackBerry 10 versions of BBM for now. 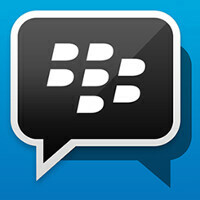 BBM 2.6 is now available for iOS, Android and BlackBerry 10 users of the messaging app. One new feature allows you to send stickers in a group chat. Speaking of stickers, BlackBerry has a current promotion going on that allows you to buy any sticker pack for just 99 cents. If you use stickers on BBM, now is the time to take advantage of this limited time offer. The update also increases the maximum time that you can have a timed message appear, to 60 seconds. Timed messages can be viewed multiple times until the clock runs down to zero. We recently told you that the BBM for iOS beta included a new UI that supports the look of iOS 8 and the larger screen sizes of the Apple iPhone 6 and Apple iPhone 6 Plus. This new look is included in the update of BBM for iOS. Android users of BBM are getting their own UI change with the new update. The messaging app now supports Android 5.0, and will work in landscape mode. Not be left out, BlackBerry 10 users can now share multiple pictures and attachments at the same time. Be on the lookout for the update to BBM. While it could be ready for you now, it might just take a day or longer for it to show up in your app store. Great to see that BlackBerry is paying such close attention to the users of its BBM app and issuing updates as needed. It's always nice when OEM'S pay close attention to their products to make them the best they can be for its users. Meanwhile I lost the online status in Hangouts....again!